What's better than a box of 9mm Luger ammo? 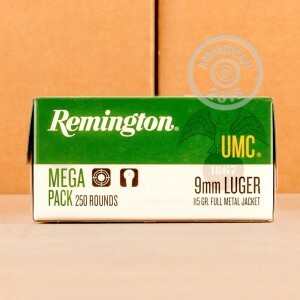 A Mega Pack of 9mm Luger ammo! 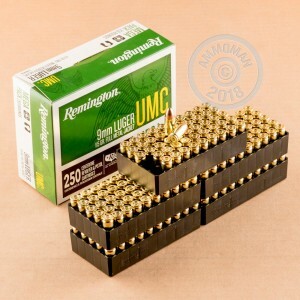 This 250-round case from Remington UMC has all the cartridges you need for a decent range session. Each round in this case fires a 115 grain full metal jacket bullet at 1,145 feet per second. This standard pressure load works well in compact handguns like the Glock 43, SIG P938, and Kahr CW9. This ammo uses non-corrosive primers and reloadable brass cases; like other Remington products, it is made in Lonoke, Arkansas. Grab a couple of these cases or add other items to your cart totaling $99 or more at AmmoMan.com to get free shipping!